This is Part 6 of The 8 C’s of Plotting. Click here for the whole series on the 8 C’s. Or click the image below to be taken to the General Fiction Feed. Since last week’s post was a bit late, I’m going to round out the rest of Act 2 today. Buckle up; it’s a lot of new stuff. Last week we talked about Preparation and Problems, the longest section of the book. We also mentioned a thing or two about Pinch Points. As you may have noticed, the 8 C’s is based loosely on the 3-Act structure, but there are differences. If you’d like the 3-Act structure broken down into a list of terms and regulations, read Larry Brooks’ posts on StoryFix (while I think his blog is valuable, I will say he tends to ramble, and the last time I visited the site, navigating from post to post was about as easy as scrambling up a fireman’s pole). I’ve read literally hundreds of blog posts and articles and books about the 3-Act structure, yet I was still dissatisfied to the point of creating my own method. Why? The Midpoint. No one can seem to pinpoint it exactly. There are varying definitions: It’s an epiphany, it’s a change in tactics, it’s the turning point or “point of no return.” Yet people will take a book or movie and argue what the midpoint is. 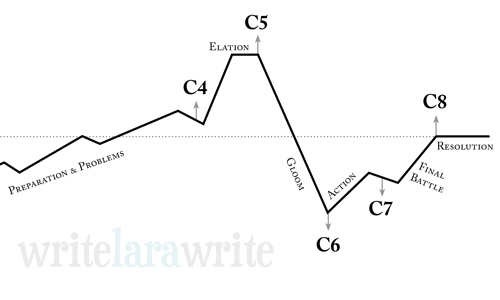 Or, if you are in a literature class looking at Freytag’s Pyramid, what the CLIMAX is. Note, the climactic scene—the highest point of tension at the end of a novel—isn’t the midpoint. Make sure something interesting happens in the middle of your book, or the plot will sag in the middle. Remind the reader about the ANTAGONISTIC FORCE, you know, so they don’t forget. And also to keep the story moving. I talk more about pinch points in part 5, also. Blogs like Larry Brooks’ will give you exact places to put the midpoints and two major pinch points: Pinch Point I at 37.5% (3/8ths), Midpoint IN THE MIDDLE, Pinch Point II at 62.5% (5/8ths). Adhere to that if you wish. I probably will whether I intend to or not. But plenty of novelists and screenwriters will throw things around at earlier or later points in the story, and they are just fine. But note, certain strict adherents might blog about your straying from the holy percentage points. Bottom line: somewhere around the halfway point, make the protagonist change tactics or realize a new goal. In Tangled, the midpoint is the elation, when Rapunzel finally gets to see the lights and realizes that being Flynn’s honey is her new goal. In The Hunger Games, the collapse is the midpoint. If you want guidelines to shoot for, then take your target word count for age and genre, and apply these percentage points: Change, 10%; Complication, as early as 18%, no later than 25%; Pinch Point I at 37–38% (during Preparation & Problems); Elation or Collapse at 50%; Comprehension somewhere between 70–80% (see below); Final Battle from 90% to 99%. It’s fine to stray from these targets! Think of the 8 C’s as an accordion. You can stretch or shrink as needed. Now let’s get back to the 8 C’s. Like the explosive C-4, the Confrontation is pretty perilous. And like its name suggests, it’s the first confrontation between the protagonist and the [capital-A] Antagonist after the protagonist has prepared and acquired skills and allies in preparation & problems. If your protagonist is a boxer, the confrontation will be the last match in the semi-finals. I say “Capital-A Antagonist” because in the preparation and problems sequence of events, your protagonist(s) will face a number of antagonists and antagonistic forces. The Confrontation is the “First Battle” with whichever antagonist they will face-off with in the Final Battle. Endorphins are surging. In The Lion King, the Confrontation was the midpoint, when Simba decides to stop running from his past and run TOWARD it, backed up by a motivating Swahili chant. This is the elation scene, and it lasts less than twenty seconds. In The Hunger Games, the elation segment is a bit longer, which is a nice relief for us readers, who have been on the edge of our seats, getting paper cuts from turning pages so quickly. It’s when Katniss allies with Rue and makes a plan [to blow up the Careers’ stash of food]. This is the near-fatal blow to the protagonist. The boxer gets punched in the face and falls to the canvas. (Major Spoiler) In The Hunger Games, [Rue is killed by another tribute]. Later, it starts raining with thunder and lightning. 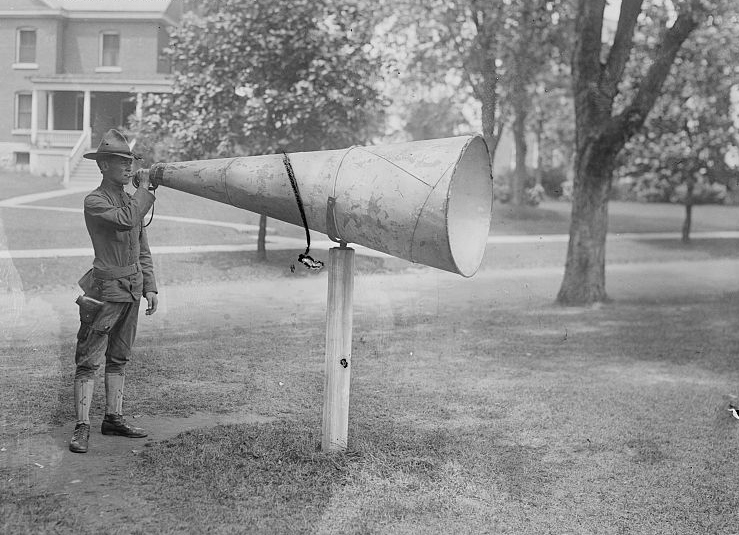 You might not be able to control the soundtrack for your novel—your readers may be listening to Miley Cyrus, for all you know—but you can control the mood of the novel with word choice and atmosphere. 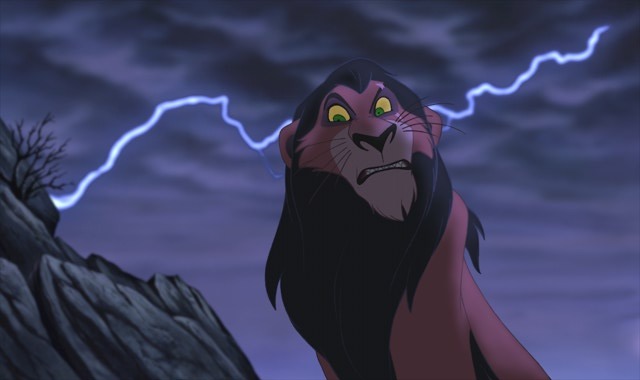 The collapse in The Lion King is when Simba sees firsthand the consequence of his leaving, and what is at stake if he fails, when he witnesses [Scar hitting Sarabi, Simba’s mother]. The collapse reminds the audience what the protagonist stands to lose. Depending how severe the collapse is, you may end your chapter on it. Just be careful that it is a cliffhanger that keeps the reader reading. If it’s a real sock to the gut, then you’ll need at least a glimmer of hope for the reader before the chapter ends, so he or she knows all hope isn’t lost. Sometimes writers add a cliffhanger directly before the near-fatal blow, delivering that sucker-punch in the first line of the next chapter. THAT will definitely keep your reader going, since they know it isn’t the end of the story! The gloom is whatever follows the collapse, and can be long and drawn out or just a few sentences. Either things can get worse, and they do, or they can’t possibly get any worse. The Princess Bride chooses the former route. Buttercup and Westley hit their elation when they survive the Fire Swamp together as a couple. They are separated in the collapse. For Westley and Buttercup, things only get worse: [He’s tortured to death, and she’s forced to marry the nasty Prince]. Meanwhile, William Goldman takes the opportunity to give lavish backstory on Inigo and Fezzik, to the point that the “Gloom” is the longest section of the original novel. Yet it works! See, there is freedom. We see both in The Hunger Games when [Katniss buries Rue and grieves for her] and [Katniss recognizes that The Capitol was the real killer (Pinch Point 2)]. In the gloom of The Lion King, Simba has to face his problems and its consequences: [He tells the lionesses that he was to blame for Mufasa’s death. Then Scar calls him a murderer and backs him off a cliff. “This looks familiar”]. Summary: The gloom is the natural outplay of whatever happens in the Collapse. It is primarily reaction and is a great opportunity to spend some time in other viewpoints or on the B story. The protagonist can only make progress towards the goal again after the comprehension. This one’s big. It’s the Awakening, either figuratively or physically. When all hope seems to be lost, the Hero learns new information, regains consciousness, or gets help from someone or -thing. Comprehension aligns pretty nicely with Plot Point II,* and it’s what ends the second act. It’s the BIG turning point. Everything after this is the ending. This is the stuff you won’t see in the trailer, because the Comprehension is the thing the writer keeps up a sleeve to deal at the last, best moment. *Note: in the 3-Act structure, the second Plot Point may be assigned to anything that happens between C5 and C6. That wraps up Act II! Next week we will talk about endings.